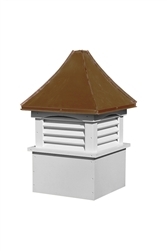 Our vinyl cupolas are made in the heart of Ohio's Amish country and are completely maintenance free. Designed to fit any roof pitch up to 12/12 pitch with no need of cutting any holes in your roof, all you need for installation is 4 screws. No need to paint.